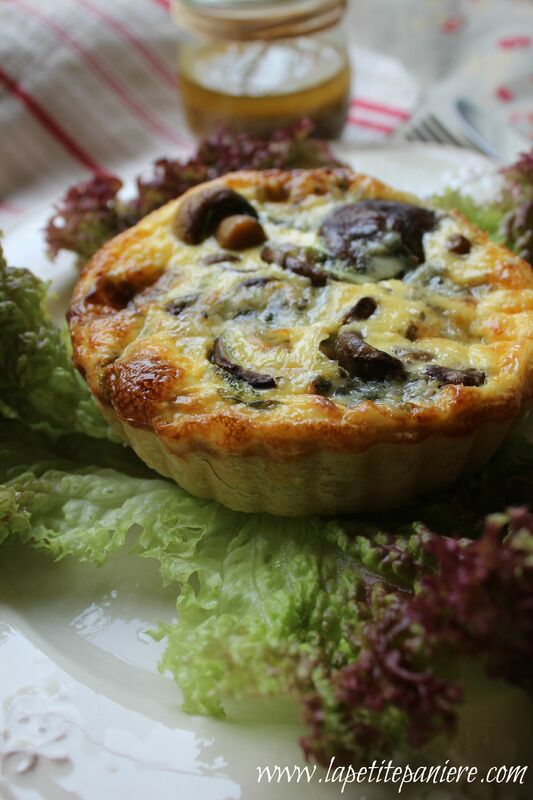 I like quiches, mushrooms, and Roquefort, and so I decided to combine the three for a delicious classic quiche for lunch! Accompanied with a red leaf lettuce. Grease 5 individual removable bottom tart pans (13 centimeters and 3 centimeters deep). Cut the dough into 5 equals parts. With a rolling pin, flatten the first dough the size of your tart pan. Add delicately the flattened dough into the tart pan. Poke the bottom of the dough. Proceed the same way for the rest of the dough and set aside. Wash the mushrooms delicately and put them into a colander. In a large pan add 1 tablespoon of salted butter and the mushrooms. Sauté the mushrooms a few minutes until they become extremely moist (stir the entire time with a wooden spoon). Pour the mushrooms into the bottom of each tart pan. Sprinkle with Roquefort on the top of each tart. In a bowl pour the heavy cream and 1 egg. Whisk the 2 ingredients together then add the salt, the black pepper and finally the nutmeg. Pour the mixture on the top of each tart. Bake for 45 minutes (more or less depending on the oven). Serve with the red leaf lettuce on the side with a homemade dressing (125ml of extra virgin oil, 1 generous tablespoon of whole grain mustard and 1 tablespoon of velvet balsamic vinegar). 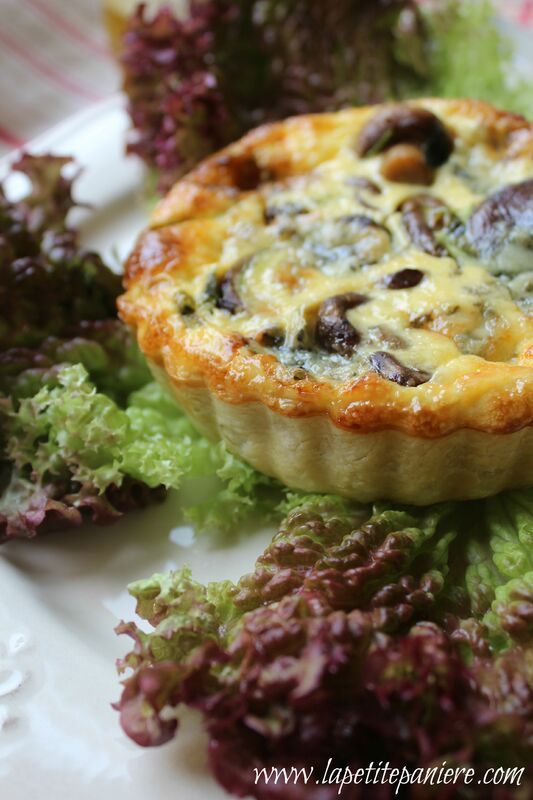 I like the flaky texture of the quiche and the strong flavor of the Roquefort. I love and make quiches quite often. It is always delightful to see being made with ingredients I have never used, in this case, Roquefort cheese! Should have clicked on your blog ere I made lunch 🙂 ! Had all the ingredients, used most but differently – this for fun later!! Can’t get crimini in rural Australia, but methinks what we call ‘Swiss Browns’ will do . . . grow them myself . . .
Grand combination of flavours. Yum! Nice flavor combination and beautiful photos! This looks absolutely packed full of flavour Linda! I’ve never been a huge fan of blue cheese (something I need to work on… I know!) but can imagine it adds a nice tang to the filling in this quiche. Absolutely adore mushrooms! Fabulous quiche Linda! Very rustic and very elegant!! I am enjoying your blog, and this recipe looks so delicious and flavorful! What a lovely combination of flavors, Linda & they sure look lovely! 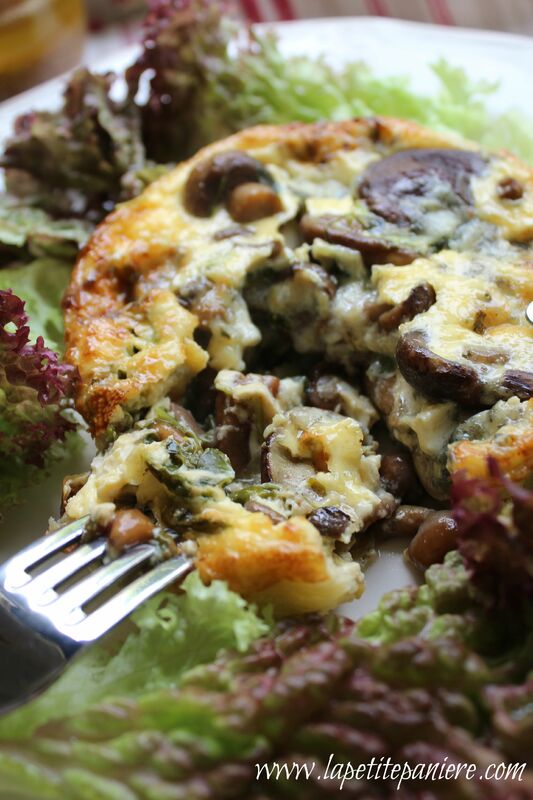 These Mushroom Quiche looks so delicious,hungry already….